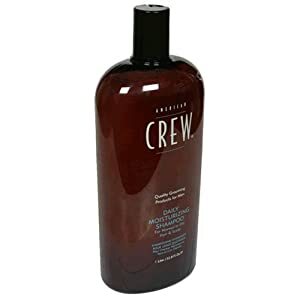 American Crew Daily Moisturizing Shampoo refreshes the hair and scalp. Contains Hydrolyzed Wheat Protein, Sage Extract, and Rice Bran Oil to moisturize and condition the hair, without weighing it down. With natural extracts like Quillaja, Rosemary, and Sage, this shampoo soothes and replenishes, leaving the scalp feeling healthy and refreshed. Recommended for everyday use on normal to dry hair. This product is authorized for sale through professional hairstylists only in an excusive arrangement with American Crew. Made in the USA.